Patti LaBelle’s Sweet Potato Pie is trending and there are food companies nationwide afflicted with pie envy. Back in the day we would have heard it through the grapevine, but in this era of social media with do-it-yourself video, Facebook and the Twitterverse, sales of Patti’s pie are on fire. Now there are plenty of voices chiming in about mom and grandmama’s pies and home cookin’. Now I know how much folks love sweet potato pie and the Patti Pie phenomenon confirms this long standing love affair. Here is one of my favorite recipes for Sweet Potato Gems. 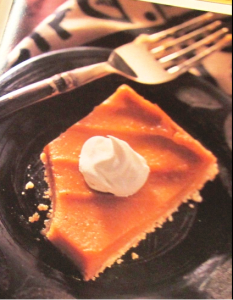 They have all the flavor of classic sweet potato pie with a fraction of the calories. At last, you can enjoy almost all you can eat with these 160-calorie squares. No worries, you won’t turn into a fat boy or girl. Heat oven to 375°. Lightly grease and flour 13- x 9-inch pan. In small bowl, beat margarine and sugar until light and fluffy. Gradually add combined flour, graham cracker crumbs, and nuts, mixing until well blended. Press onto bottom and slightly up the side of the prepared pan. Bake at 375°, 10 to 12 minutes. Cool slightly. Reduce oven temperature to 350°. In large bowl, combine sweet potatoes and yogurt, mixing until blended. Combine remaining ingredients and add to sweet potato mixture, continue mixing until smooth. Pour sweet potato mixture over partially baked crust. Bake at 350°, 20 to 25 minutes or until knife inserted into center comes out clean. Cool completely. Cut into squares. Top each serving with whipped cream, if desired. Store in refrigerator.